1. Check the depth of cut line, adjust the value of smaller diameter. 2. Line transmission wheel gap is too large, adjust the gap into line transmission wheel. 3. Set stripping head is larger than 2mm. 4. Line possession of stolen goods. 5. Retract set too, need to be reduced. 2. round qualifying transmission gap is too large, adjust the gap is small qualifying transmission wheel. The retraction is set too small need adjusting. 1. Adjust the gap into the transmission wheel and outgoing transmission line between rounds. 2. The contact with the factory, replace the transmission wheel. 1. Bring a large diameter value until the appropriate level (blade just cut the skin but not hurt stringing wire core for the best position). 2. If the line is very thin skin, after peeling can not be transferred to the diameter found, it may be appropriate to reduce the retraction value. 1. Line transmission wheel gap is too big, and sometimes not peel open thread, thread stripping line not open more than a set length, adjust the "Line lash adjuster wheel", increasing the pressure. 2. Line pipe, there are stolen goods, check and properly cleaned. 3. Adjust the pressure line transmission wheel. 1. The wire itself varying thickness. 2. Scroll wheels have stolen goods, the need to clean up. Wire surface wax, resulting in the inlet and outlet transfer wheel slip. 3. Remove the line, the program is set to "00", the dry run, stop and check "into, qualifying round of the" rotation is flexible or catching phenomenon. 4. line planes have catching phenomenon, leading to the input line slipping phenomenon. 1. The diameter is too small, knife cut to the core, when stripping out, the need to increase the diameter value of 1-2. 2. Retract set too small, it should be appropriate to increase the retraction parameters. 1. Place the blade moving parts add oil, try (usually refuel once every 8 hours of operation). 2. will slow the pace, and try again. 3. 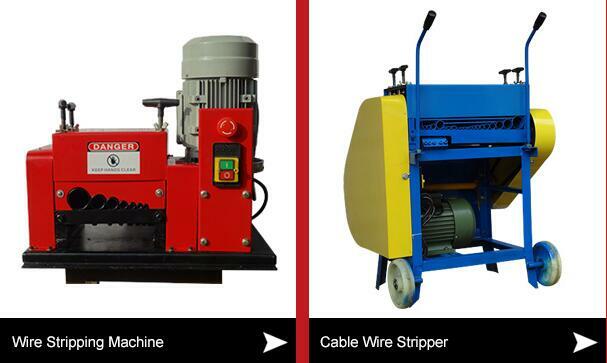 Check the wire specifications, please allow this type of models within the range. 4. Does the blades become dull. 1. Bend the wire itself too, need to straighten.